Jennifer Russell Are You Really Committed to What You Say You Are? Are You Really Committed to What You Say You Are? Our commitments lie in what we’re actually doing, not in what we value. What you do is what you’re truly committed to, what you value is aspiration. There are companies that mistake these two things all the time. Companies will say in their mission statement every universally positive thing about their company. We are going to be the best company in the world with the best quality, hiring the best people, with the most profit in the world. Let’s say this company says quality is really their top value, but they’re bidding low on materials that are cheaper. They’re rushing orders rather than taking the time to make them right. And so forth. So they’re in conflict. What their value says versus what they say they’re committed to and their behaviors don’t all line up. What I want to do, because it’s easier to create change if you’re walking in reality than illusion, is to see where our commitments are as reflected in how we’re spending our time. We’re full of hypocrisy as humans. We value being honest and yet we tell lies. We’re committed to it, but yet nobody is perfect. What’s generally occurring is we have a hierarchy of commitments. I may say I have a commitment to honesty, but in the moment I tell a lie, I’m actually committed to something else that’s more important. It could be I don’t want to rock the boat. I want to keep harmony. I don’t want to hurt the person’s feelings. When it’s hurt feelings versus honesty, my commitment is to avoid hurt feelings, so that one wins. For me, safety is usually at the top of my commitments. Then for me might come money. If I have safety and money figured out, I have enough left over for relationship or love. If I have those three things figured out, I might have time for health or vitality. I want all of these things. I’m committed to all of these things, but when they are at odds, one of them has to take precedence. For instance, if I don’t have money, I’m not going to have any bandwidth for health. What you want to look at with your commitments is what’s actually happening. What are you actually committed to? There’s always something on the other side of our commitments that’s more important than the commitment we make in the first place. I want us to get present with what they really are. You’re going to take all of the available working hours, the hours you’re willing to work. Are you willing to work 24 hours every day? It isn’t the number of hours you’re actually working. It’s the number of hours that you are willing to work in a day. If that’s eight, it’s eight. It could be ten. Not that you’re working all ten of those hours, but you’re willing. If you got a call and a project came in, you’d be willing to work that number of hours. 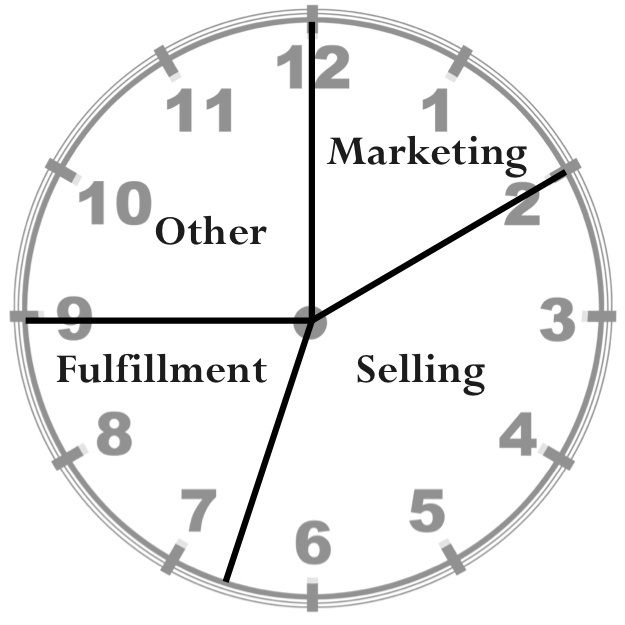 I want you to come up with what that number is, hours per day that you’re willing to put towards your business. We want to take a snapshot. There’s a very particular reason I want you to look right now. I want you to see where your commitments actually are as reflected by how you’re spending your time. Leave a comment below to let me know…what is the reality of your commitment? Are you really committed to what you say you are or does something else rank higher?